Residents of a North Yorkshire village are campaigning for a change in the law to stop bats spoiling their church. St Hilda's in Ellerburn, near Thornton-le-Dale, has become home to a species of protected bat and residents say their droppings are causing damage. They want to keep the Natterer's bats out of the church by confining them to the roof, but need a change in current laws to allow them to do it. Bat experts have warned a change could threaten the bats. 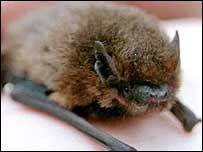 John Drewett, chairman of the North Yorkshire Bat Group, said he did not think the law needed to be altered. "That would open up the possibility of people excluding bats from a vast number of properties, which happened before they were protected. "That is why it became a necessity to protect them in the first place." Ryedale MP John Greenway has told the parish he will look into the possibility of new legislation. Bats and their homes are protected under wildlife laws because they are an endangered species. "St Hilda's is facing its greatest threat"